What should I say about my motivation in the Entrepreneurial Drive McKinsey PEI dimension? Looking at this question firstly from slightly broader perspective, your example for the Entrepreneurial Drive dimension should circle around a situation in which you wanted to achieve something by yourself (and no one else imposed this task on you). If you follow a goal which you wanted to achieve yourself, you should be also able to explain a strong motivation behind taking all those efforts and overcoming many obstalces to reach this goal. Additional note: Whenever possible, you should also try to specify your goal exactly and quantify it (e.g. like “my goal was increasing new member growth by 100%, resulting in a total membership base of 2.000 students within 1 year” instead of “my goal was to improve new member acquisition and having a larger base of members”). 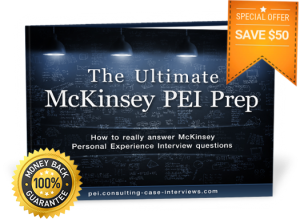 You can find much more information about how to perfectly prepare your McKinsey PEI in The Ultimate McKinsey PEI Prep eBook! Previous Previous post: Why is the McKinsey PEI so important for the overall evaluation of a candidate?